Oregon’s Avnera Corporation has announced its new AudioMagic 2G technology, which the company claims is the world’s first wireless audio system that can handle multiple simultaneous streams of high-definition, uncompressed audio in any send/receive combination. According to the company, the technology rolls in seven “audio technology breakthroughs” to handle pushing wireless audio around the home, marking a new heyday for consumers looking for integrated in-home audio systems without the hassles of running wires between rooms and through walls. And electronic retails Best Buy is all over the technology: for now, it’s exclusively available in four Best Buy Rocketfish products, although it will eventually be available in gear from other manufacturers. Products using AudioMagic 2G technology can handle up to five simultaneous audio streams that can be played back on up to nine receivers. Any receiver can tap into music from any sender, so users can switch easily between multiple stream sources. 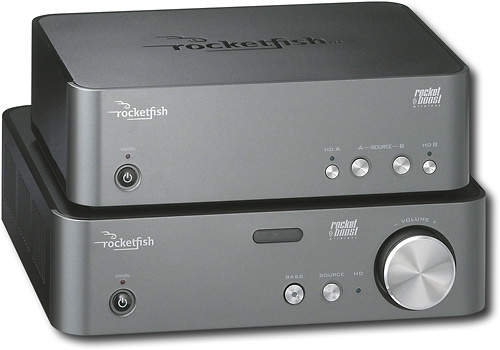 In theory, setting up a home audio network with Rocketboost is as easy as buying compatible gear and pressing two “pairing” buttons on the units. The devices operate without interfering with other 2.4 GHz devices like cordless phones, microwaves, or wireless routers. Best Buy is the first out the gate with the technology offering a $199.99 Wireless HD Audio Starter Kit to tap into existing home theater setups, a $59.99 Rocketfish Sender/Receiver, a $179.99 Sender/Receiver as an outdoor speaker, and a $99.99 Amplified Audio Receiver designed to hook up to existing speaker systems. All four products are available now.